Carlo and Giovanni Gatti ran coffee and ice rooms (providing refreshment and musical entertainment) in Hungerford market for 7 years before the market was demolished to make way for Charing Cross Station. With the money they received in compensation Carlo leased a new building situated 'under the arches' of the station. This hall soon became a 'Music Hall' with audiences seated at tables and a chairman acting as maitre'd. The brothers also opened another theatre in Westminster Bridge Road. 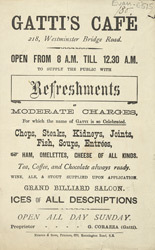 The restaurants and cafes in the theatres quickly became popular eateries.